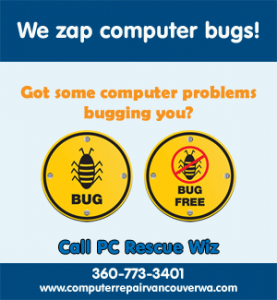 If you are looking for quality computer repair in Vancouver WA, PC Rescue Wiz gets the job done! Our computer repair shop offers laptop repair, virus removal and general computer service in Vancouver WA. Also, we offer both in-shop and on-site computer service for home and small businesses in Vancouver Washington. As a licensed business in Vancouver WA, we have been proudly serving Vancouver for almost 5 years. Our goal is and has always been to provide our customers with the best PC repair service at a good and fair price! Call 360-773-3401 to schedule an appointment for computer service or repair. If you read the reviews by our customers over the years, you can see that our priority is giving our customers the best computer repair service in Vancouver WA. Our mission is to provide fast, reliable and affordable PC repair service to all our customers. This means that when you choose PC Rescue Wiz computer service, you can expect quality service at a reasonable price! We offer in-shop computer repair and on-site computer service in Vancouver WA and in some areas within a few miles of Vancouver Washington. Our hourly rates for computer service depend on whether you to bring your computer to our computer repair shop, or if you want us to come to your home or business. Please visit our pricing page for more details. To get a quote, please bring your computer in for an assessment. It’s free! We diagnose and fix computer startup problems, blue screens, blank screens and more. Is your computer running slower than usual? If yes, that means it’s time for computer service. Our computer maintenance service helps to prevent serious computer problems by assessing and fixing hardware and software issues that slow down a computer. Regular computer maintenance helps to keep your computer running as good as new and also helps to extend the life of your computer. Call 360-773-3401 to schedule a service appointment.